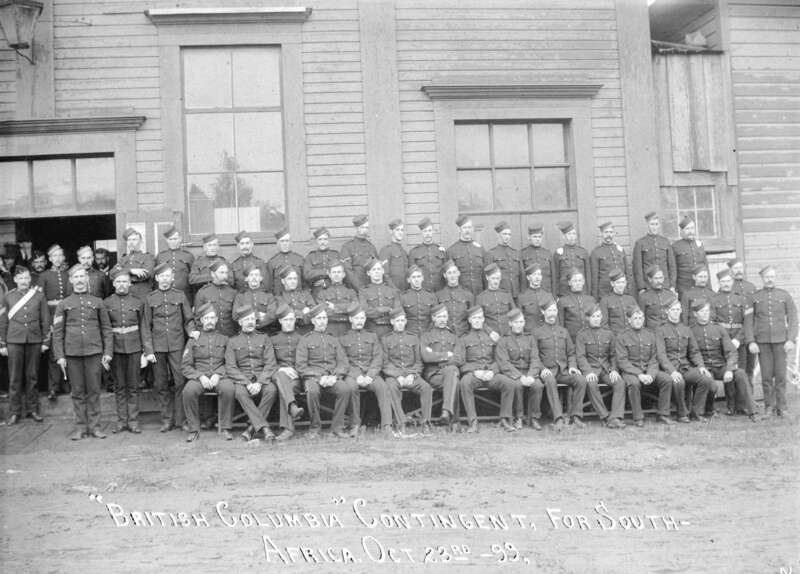 Group portrait showing "A" Company, 2nd Battalion, Royal Canadian Regiment in front of the old drill shed (formerly the Imperial Opera House) on Pender Street at the foot of Beatty Street prior departure to South Africa: (in doorway) Henderson, F. Kennedy, W.W. Foster, Cornish, J. Reynolds Tite; left to right (sitting): John Moscrop, A Lohman, H. Neibergall, Otway Wilkie, Robert Mackie, A. Battson, J. Porter Smith, C. Leamy, Charles S. Court, George Wallace, George Neill, Todd, Frederick T. Cornwall, Arthur Carter; (middle row): William I. Scott, John H. Somers, S.W. O'Brien, W. Jackson, George S. Hutchings, J.H. Livingstone, A.J. Nye, W.H. Brooking, Ralph W.J. Lehman, William H. Brethour, James Anderton, John H. Dixon, Frank Dickinson, James Stewart, James W. Jones, Frank Finch-Smiles, R. McCalmont, Henry J.D. Andrews, Sgt. Joseph Northcott; (back row): J.J. Sinclair, Percy Greaves, H.J. Allan, H.W. Bonner, F.W. Whitely, C.C, Thompson, W.D. Wallace, G.B. Corbould, Alexander M. Woods, Seymour H. O'Dell, Clark W. Gamble, Arthur Maundrell, Alexander C. Beach, Henry Smethurst, William H. Stebbings, Cecil M. Roberts.